Do you suddenly find yourself running out of energy two sets into the match or unable to coax an extra 10 percent from your legs when the action reaches a climax? Then you need to start looking again at your fitness programme. Very often, players forget to keep looking at their conditioning as the technical side of their game improves. This means that the questions they were asking of their body when they were starting out are not the ones they are posing now. 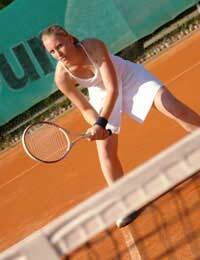 Better technique can mean longer rallies and extended sets, all of which involves more mental and physical strength to cope in the heat of battle. First of all, look at your circuit training. Are there particular muscle groups that are taking more strain? That improved service action may mean your upper body requires a little more attention. And what about general fitness work such as running or swimming? If, for example, you have increased the length and intensity of sessions in a bid to get fitter and faster, your efforts may be having a negative effect, leaving you with little in reserve when you get on court. A similar scenario will develop if you start scaling down the number of rest days that were built into the programme. Your body needs time to recover – never forget that. So don’t burn yourself out even before you’ve picked up the racket. Rather, make sure that your programme is designed so that come match day, your body is at its peak. Nutrition is another vital area that should not be neglected. Without the fuel to power your fitness programme, you’ll be running on empty very quickly. Remember to eat at regular intervals and before training sessions and matches. Topping up energy levels between points is also important, particularly as you get fitter and you find that matches are becoming longer and more intense. So don’t sell yourself short by not packing enough solids and liquids on match day, otherwise the difference between victory and defeat may well hang on which player still had reserves of energy to call upon at the vital moment. Both your nutritional regime and training programme should be revisited at regular intervals to ensure they are keeping up with your fitness levels. If you started out by consulting a personal trainer, go back to them and tell them how your priorities have changed and how best you can address them. Don’t forget, too, that following a rigid programme can result in a certain amount of mental fatigue. In other words, you begin to get bored. So look at perhaps swapping some of your running for some bike work, or spending more time in the pool. Having got over the initial hurdle of achieving a decent fitness level, you’ve got to be setting yourself new challenges in order to keep things fresh. But always remember that your programme is geared towards making you better on court. So don’t overtrain to the detriment of your technical ability. You can be the fittest player in the world, but without the corresponding range of shots, your game will not improve. Get the balance right, and you will reap the dividends.